Koova is a compact camera robot embedded with WebRTC and powered by standard USB power banks to auto-track and face-recognize human. Amsterdam, Netherlands, November 15, 2016 --(PR.com)-- Amaryllo International B.V. (Amaryllo), founded in Amsterdam, the Netherlands, announces that its 3 new camera robots, Koova, ATOM AR3 and ATOM AR3S have won 2017 CES Innovation Awards, marking Amaryllo the CES Innovation Award winner 3 years in a row. Koova is the smallest intelligent camera robot that can be powered by standard USB power banks. Koova is a compact camera robot transformed from its predecessor that won the 2015 CES Best of Innovation Award. Standing at less than 4.8” inches tall, Koova is smaller than iPhone 5. Koova has embedded high-power CPUs so it can learn to recognize your faces and knows who you are in seconds. Unlike conventional facial recognition technologies that require a wide internet bandwidth to upload a huge amount of video data to cloud computers, Koova can detect human faces and fast recognize your faces in just seconds. Koova’s unique ability to send human face alerts greatly reduces common false alarm triggered by popular passive infrared sensors and typical audio sensors. Koova has built-in speech functions to say “Hello,” “Good Morning,” “Good Afternoon” when human faces are detected. 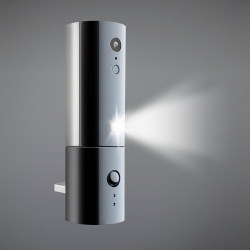 Koova employs HD 720 resolution to track intruders over 40 feet away. It says “You’ve got mail” when new email arrives to prompt your attention. Koova announces hourly time by saying “It’s 2 pm” to keep you updated of present time. Unlike conventional smart home products that are based on simple 64-bit encryption, which can be hacked in minutes, All of Amaryllo products employ military-grade 256-bit encryption technologies to offer the best privacy protection. Amaryllo’s dynamic peer-to-peer video server automatically adjusts video quality based on available bandwidth to reduce video latency and offers the best streaming video experience. Amaryllo offers free rolling 24-hour unlimited cloud storage for each of its devices, allowing consumers to access recorded video fast and safe. For more details, please visit Amaryllo’s Indiegogo campaign or contact Amaryllo at sales.ai@amaryllo.eu. For complete Amaryllo product information, please visit Amaryllo website at www.amaryllo.eu. Amaryllo International B.V. (Amaryllo) is a worldwide leading intelligent camera robot company. Founded in Amsterdam, the Netherlands with facilities in Asia, Amaryllo develops award-winning robotic cameras and home security products. Amaryllo is a licensee of Apple MFi, Skype Developer, Windows Developer, Google Play Developer, AAC+, UPnP, Bluetooth SIG, etc. Click here to view the list of recent Press Releases from Amaryllo International B.V.